Riley K. is 15 and attends Foothill Technology High School. See her editorial, below, about impaired driving and how it affects her community. Many thanks to the Foothill Dragon Press for allowing us to reprint this article. Watch for our interview with Riley soon! We have all been told time and time again throughout school that drugs and alcohol are bad, and that we should never take drugs or consume large amounts of alcohol, especially when you’re under the legal age. We are taught that ultimately, doing drugs at any age and drinking alcohol as a minor will lead to nothing but trouble. Our first and only thoughts to this is “Well duh. Everyone knows that,” and then we push the thought to the back of our mind, letting the thought of what we’re eating for lunch take priority. What isn’t stressed, however, is what will happen to the people around you. Every other year, Foothill holds a week long event called Every 15 Minutes, which stresses the significance of driving under the influence. Every 15 Minutes has a car crash simulation that lets students see and feel the effects of drunk driving, without the actual risks. Videos are shown of other students who have done the drunk driving simulation, where they see what their parents reactions would be upon hearing that their children were dead, and what their funerals would be like. This is to show not only the students participating but also the students watching the video how serious an issue drunk driving is, and how it can affect the people around you. Some of you who just read the quote may may not have as much of an emotional connection with this quote, and it may not make you as angry if you haven’t experienced losing someone first hand because of drunk driving, because it’s harder to fully understand how devastating drunk driving can be. About three years ago Nick Haverland, a Foothill alumnus from the class of 2009, was killed by a drunk driver. It was a hit-run, and the driver had already caused two other accidents. The driver had hit a pickup truck which had held a family of three, and a mother and daughter, both of whom had had their arms broken from the accident. I personally knew Nick. He graduated with my sister, and was one of her friends. I saw him at my house so many times, I considered him my friend despite the seven-year age gap. He truly was a great person, and was fun to be around, and I thought that the days of him being over at my house when my sister was home from college would continue for a long time. That seeing him cooking food in our kitchen would continue happening as long as he and my sister were in the Ventura area. 20 is too young to die, and 12 is too young to lose a friend. When you hear about someone dying from being hit by a drunk driver without personally knowing that person, you think that it’s sad, and move on with your day. When you do know them, though, it feels unreal. You can’t help but wonder why this happened, why they had to die, and that they did nothing to deserve this. You want to do something about it, but you know you can’t. Then you start to wonder how someone could be stupid enough to drive under the influence of drugs or alcohol. We have all learned in school about how doing drugs and consuming alcohol as a minor are both bad, and driving under the influence is especially bad. So why are people still doing it? In 2011, over 1.2 million drivers were arrested for driving under the influence, one-third of them being repeat offenders. An average of one in three people will be involved in a drunk driving accident in their lifetime. Maybe people think it’s okay, maybe they when they get in their car they think they’re completely fine to drive. When you are under the influence of drugs and alcohol, you can’t make completely logical decisions. However, even though you aren’t completely aware of your actions, driving under the influence is never okay. Needless to say, this is a problem. More people need to realize that if they were to drive under the influence, it is more than likely they will not only be hurting themselves, but the people around them. 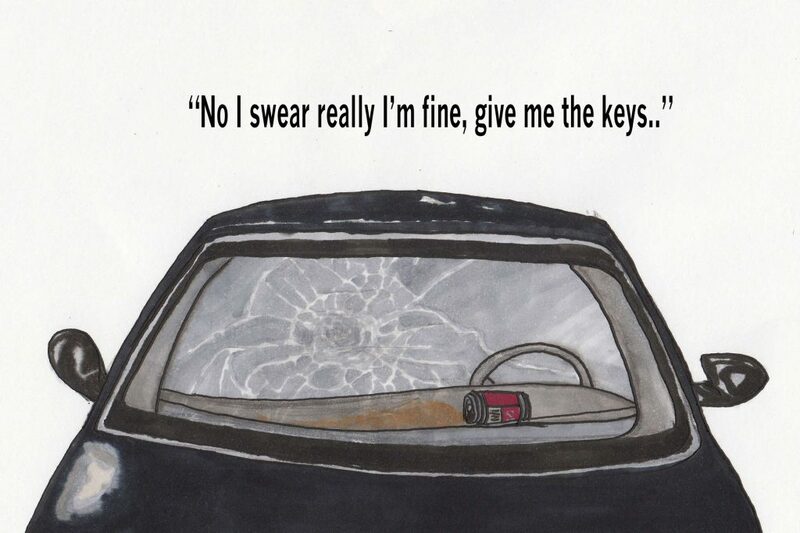 The driver is not the only person affected when they drive under the influence. The driver affects the people who they hit, along with all of the people who knew that person. Even if they are so drunk or have taken so much drugs that they don’t realize it when they kill someone, they still killed someone. They still robbed them of their future, and they took that person away from everyone who knew and loved them. When someone is dead, you can never get them back. The feeling of losing a loved one because of someone else driving under the influence is something I sincerely wish no one will experience. You feel angry at the person who decided to drive under the influence of drugs or alcohol, you feel almost depressed because you’ve lost someone, and then lost when what happened really sinks in, and frustrated because you feel like you can’t do anything about what happened. Whether you were a family member or friend, you can’t feel like you really got justice when the person is sentenced because you still lost someone who’s precious to you. I am sad to say that Foothill and most residents of Ventura have to experience this feeling. On Sunday April 6, we lost Chris Prewitt, a genuinely amazing human being. What happened was tragic, and we can only offer support to his family during this time. Nothing good comes out of driving under the influence or even reckless driving. Whether the outcome is a fine for the driver or someone getting injured or dying, the results are never good. No one wanted what happened to Nick Haverland or Chris Prewitt to occur, but those who have felt the utterly horrible feeling of losing someone because of driving under the influence or driving recklessly knows what will happen if they ever find themselves in the choice of possibly driving under the influence, and they’ll know the weight of the mistake they will make. Instead of walking out of your class after learning about the fatal effects of driving under the influence and dismissing it, take it to heart, because the effects really are devastating, and no one should have to feel the aftermath of losing someone due to an accident caused by driving under the influence. Reprinted with permission from the Foothill Dragon Press. All rights reserved.